With today’s hectic and often stressful life, the need to be able to easily relax and recharge after an eventful day is something most of us experience. 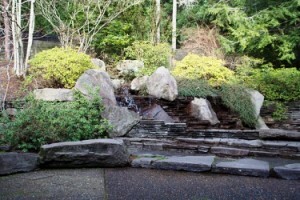 As a result, one trend in landscaping is the contemplation garden. Those small Zen rock gardens are probably the first things that come to mind when you hear the term ‘contemplation garden.’ This type of garden design is growing in popularity. However, the smaller-sized contemplation gardens have nothing on the actual Zen gardens that allow you to use a large rake on a large garden space and feel relaxed. A Zen garden – compared to a normal American garden – is rather bare, with rocks and minimal objects within it, unlike an American garden that has plants and flowers competing for space. Zen gardens have nothing to really focus on, which means your mind must find a focal point; in a traditional Western garden you have a lot to choose from. If you sit in a regular Western garden, you may think of chores that you need to do such as weeds that should be pulled or flowers that should e dead-headed. The purpose of a contemplation garden is to have a spot in your yard for you to be at peace and meditate or contemplate life without distraction. Looking through four main concepts can help you create this space. You want the area to be clear of distractions and confusion. It should provide a purpose and be clear. Other yards probably have no purpose or clear lines on where one area starts and another ends. For a contemplation space, you can define clearly-drawn ‘rooms’ within the yard. You can use small shrubs to create these rooms and define where your space begins and ends. Small paths can also provide clarity. This is a way to guide people through the yard. A simple material is all that is needed – stones, gravel, mulch, or other materials. Make the paths curve here and there so they are more beautiful than straight paths. You want to add points of entry to these rooms as well so that those walking through the yard know where to stop and go in. There should be something going on within each room to entice you to enter. Mix up the smells, textures, shapes, and sizes throughout the space. This provides more discreet areas that are all different from one another. A balance of ‘positive’ spaces with trees and flowers can be offset with a simple, flat or ‘negative’ area to enjoy. You want to have full spaces that are positive with trees and flowers and then add negative spaces where there is just flat area to enjoy. But keep things simple – if there is too much complexity going on, then you may find that it produces chaos rather than serenity. Mystery and surprise is a great part of any garden. Hidden features that aren’t easily revealed are intriguing. You can hide surprises around shrubs and other large objects going down pathways. Curved paths allow mystery to happen around each corner. Have a water feature somewhere in the yard where it cannot be seen but can be heard. The fun would be finding it. If there are hills and dips in the yard, you can plant flowers below and ponds where they might not be seen from above. You want to give off a feeling of retreat when it comes to those R & R spots throughout the garden. You want to seclude this area with lattice or other beautiful covering and allow yourself refuge from whatever it is you want to get away from. You should feel like you belong in the space. You shouldn’t have it out in the open in public view, and it only needs to be big enough for one or two people. It should be a simple spot with a few pretty things you enjoy and a seat. The plants should have minimal maintenance needs. Now is the time to find out if you can add a peaceful, comforting and serene spot to your yard in order to make the most out of it. Talk with the landscape design professionals at ALD about incorporating a contemplation garden into your yard.